An internationally recognized country X officially assigns a piece of territory (of any quality and size) to Wirtland. Country X has a stake in future sales of such land, agreed in contract. Wirtland offers the plots of land for sale. Buyers of land will be eligible for citizenship and other benefits. Country X receives up to 75% of net profit from all such sales, which goes to its budget. 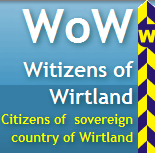 In result, country X receives profit from unused land, and Wirtland acquires its own official territory and all rights. If prices of Wirtland’s plots show positive trend, other countries may duplicate the scheme, thus adding new territories to Wirtland in various regions. According to Dr. Noel Cox, Professor of Law at Auckland University of Technology, "this is an interesting proposal". All citizens of Wirtland are welcome to take part in this discussion, which follows up to an earlier proposal to build a platform floating in international waters. Comments from non-citizens are also very welcome, and can be posted below. Wirtland is a virtual country, but the advantages it is offering are very real. 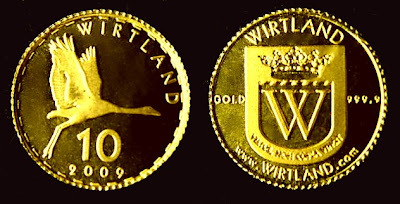 Currently Wirtland's gold coins are considered the world's best offer. As gold prices soar, the prices of gold coins go up. Wirtland is the only country which still keeps its gold prices fixed. Price of 1/10 oz. pure gold coin "Wirtland Crane" stays at 135$, while retail price of similar coin "Canadian Maple Leaf" has reached 150$ (see here). 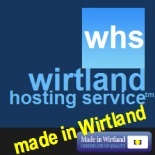 Everyone can still buy Wirtland's gold and silver coins cheaply direct from our Mint. However, with this sharp increase in gold prices we cannot guarantee that our low prices will last long.